Well, this talk is about nature in that way - but it's also about seeing God in the heavens, in the mountains, in the physical world around and above us. This is about exploration, adventure and maybe seeing things and even God in a new way. Just as the image in this picture is a cloud, but also looks a bit like an 'eye', so God reveals himself to us in his creation and in the natural world around and heavens above us! O LORD, our Lord, how majestic is your name in all the earth! You have set your glory above the heavens. From the lips of children and infants you have ordained praise because of your enemies, to silence the foe and the avenger. When I consider your heavens, the work of your fingers, the moon and the stars, which you have set in place, what is man that you are mindful of him, the son of man that you care for him? You made him a little lower than the heavenly beings and crowned him with glory and honour. You made him ruler over the works of your hands; you put everything under his feet: all flocks and herds, and the beasts of the field, the birds of the air, and the fish of the sea, all that swim the paths of the seas. O LORD, our Lord, how majestic is your name in all the earth! One of the many unique elements about God is that not only did he make the earth, he made the particles that make up the things he created! If you read the story of creation in Genesis 1 and 2, you'll see how God created the heavens, the earth, the stars, the sun, the moon, the waters, the land, the animals, plant life, bug life and then man and woman. If we look around the earth, we find that around 10,000 new species of animals are discovered each year and it's estimated there are between 2 to 50 million different animal species on earth alone. There are 950,000 species of insects alone! The earth is one tiny planet in our solar system with such a delicate system holding it in place that it's incredible. Our solar system itself is just one solar system in our Milky Way galaxy which contains 200 to 400 billion stars. The NASA Hubble telescope when fitted with a new lens, found there were 3,000 visible galaxies out there, each with hundreds of billions of stars! These findings were true as of 2002 and these are just the visible galaxies! David, the writer of Psalm 8 didn't have the Hubble telescope, but he did understand something of the majesty and awe of God. He sung praise to God, telling God how majestic his name was in all the earth. When we begin to understand even a small bit about how awesome God is (even in his creation), we can only respond by thanking him. Songs like 'Majesty' by Delirious and 'Indescribable' made popular by Chris Tomlin, are just two contemporary songs, expressing this amazement about God. A song written from Psalm 8 is Matt Gilman's 'When I Consider' (from IHOP, Kansas). In Psalm 8, David is amazed that this God of the universe - of the moon and thr stars - actually created and then cares about each of us as humans. Psalm 139 tells how God intricately put us together in our mother's womb. Matthew 6 lets us know that God knows every hair on our heads. But not only does God care so deeply and passionately, he actually crowned us with glory and honour. He made man and woman the pinnacle of his creation and breathed his life into us! He knows we're fragile and understands us, yet gives us the chance to be in relationship with him and then seats us in heaven with him - in an incredible and mysterious way we don't understand! Then one day we'll be with God forever in a heaven and galaxies yet unexplored, worshipping God and doing awesome things we can't even dream of! No wonder God gives us glimpses of his amazing wonders on this earth, it's like a foretaste of what is coming. God shows his wonders in the heavens, but his most amazing wonder and creation is you and I. That's why he's so passionate about us, so loves us and so wants us to love him - he's more than worth it! 1 Corinthians 15:40-41 (Amplified) - There are heavenly bodies (sun, moon, and stars) and there are earthly bodies (men, animals, and plants), but the beauty and glory of the heavenly bodies is of one kind, while the beauty and glory of earthly bodies is a different kind. The sun is glorious in one way, the moon is glorious in another way, and the stars are glorious in their own [distinctive] way; for one star differs from and surpasses another in its beauty and brilliance. We recently went to Colorado in the USA. It was the most amazing place, with the most amazing sights that I have ever been to. The scenery, the views, the mountains and the snow put together produced awe-inspiring scenery! One day, on the way back from a place called Loveland Pass (which itself is an amazing place at 12,000 foot - and part of the 'Continental Divide' - as well as being a place to ski!) 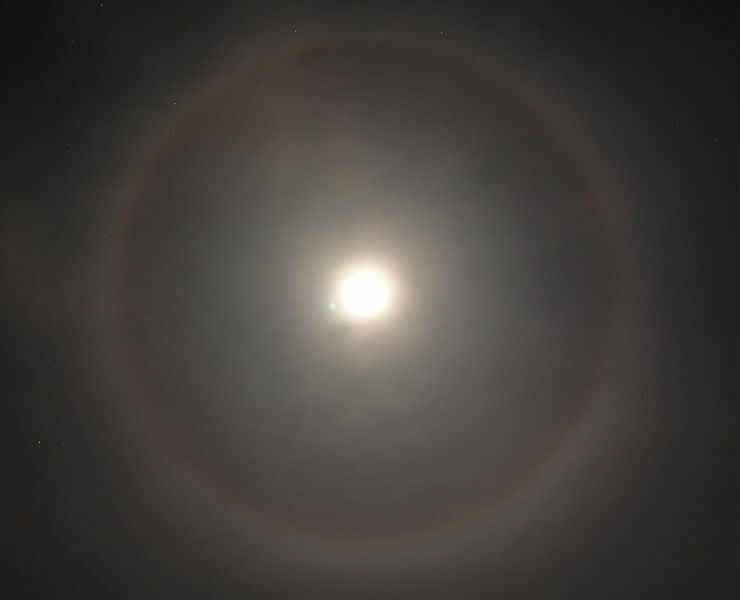 to a place called Estes Park (where we were staying at the YMCA of the Rockies), we saw an amazing large moon which gradually developed what looked like a rainbow around the edge of it. Before leaving the UK, we'd seen some amazing rainbows, a 'circumzenithal arc' and other amazing rainbow snippets in the sky. We really felt that God was speaking to us, showing us his promises and putting his glory on display in the heavens. One day a troublesome and violent neighbour (please pray for him, he's called Troy) was having a loud party and his 'friends' were getting a bit out of hand. My sister and I prayed and suddenly an 'upside down' rainbow appeared above our house. 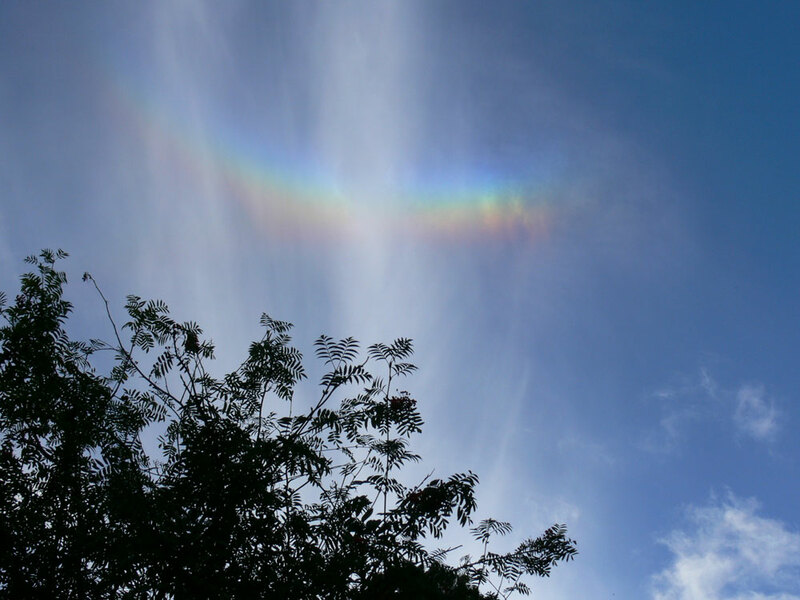 As you can see if you click on the photo, not only did the rainbow appear (called a 'circumzenithal arc'), it also looks a bit like a cross, due to the vertical cloud line. It was like God's promise, saying 'I am with you'. And he was. Just as he was with us when myself and great friends went to Colorado. One day someone said to me they felt God wanted to reveal himself to me through scenery, through mountains and amazing places and views. I took seriously what they said. Since then, God has opened up amazing doors for me to go to the Lake District, Dartmoor, the coastline of the UK, Colorado, Brecon Beacons and soon maybe even the Himalayas. I have sensed and seen God in these places and in the skies above like I have never known. God said to me, and maybe says to you, 'Go outside and you will see my glory and majesty'. God spoke to Israel through signs and wonders. He speaks to many people today in this same way. Luke 21.25 describes the end days before Jesus returns, saying "And there will be signs in the sun and moon and stars..." So there is something very powerful and very God-filled, about getting out, seeing God in nature and creation. God has revealed himself to us through his creation. Romans 1.20 says, "For since the creation of the world God's invisible qualities - his eternal power and divine nature - have been clearly seen, being understood from what has been made." So not only does God reveal himself to us, he also uses his creation to bring judgement and as his 'earthly clock'.